Established in 1827, the University of Toronto is consistently ranked first in Canada and among the top 25 universities worldwide. The University has a long history of innovation and research. It’s where Banting and Best first used insulin to treat diabetes, where Marshall McLuhan proclaimed that the medium is the message, where Frederick Teasdale and his colleagues developed Pablum and where Ernest McCulloch and James Till discovered stem cells. 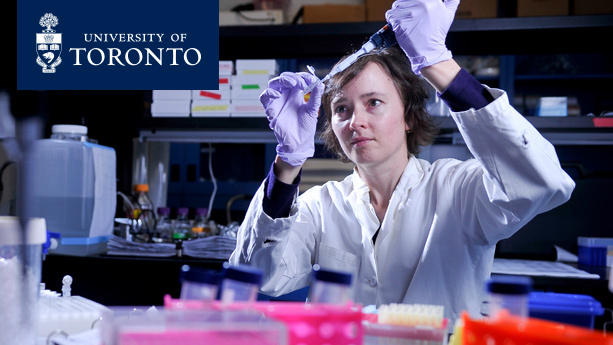 U of T has been honoured with 10 Nobel Prizes among our faculty and alumni. Research and scholarly excellence lives on in a new generation of researchers breaking important new ground in such fields as computer speech recognition, urban affairs, solar energy, quantum cryptography, transportation and medicine. Today, our research community spans three campuses and nine partner hospitals, with annual research income totalling $1.2 billion. U of T researchers publish more articles than peers at any university except Harvard. U of T consistently ranks alongside the top five U.S. universities in the world in articles cited. Since 2007, U of T has been at the heart of one of the fastest growing entrepreneurial clusters on the continent; and since 2010 no single university in North America has created more start-up companies than U of T and its partner hospitals.